Adrienne Wilkinson has been around for quite some time, entertaining us time and time again in a great number of projects. Whether it has been voice acting in animation or video games, playing the lead in critically acclaimed cinema, or popping up for a television series appearance, to say that this actress has been busy during the past few years is putting it lightly. 2014 looks to be an even bigger year for Wilkinson, and we at Capsule Computers have been graced with her presence in an interview, where we will learn more about her current projects, such as the pilot for Star Trek: Renegades, the newly released Raze, her past work in Xena Warrior Princess and Star Wars: The Force Unleashed, and much more. Read on or listen in below to learn more about this talented veteran of Hollywood, as she reflects on her career and hints at the future. CC: Hello and welcome to our audience out there. We have a very special interview for you today. Joining me is the lovely Adrienne Wilkinson. Hello Adrienne, how are you today? AW: Hey, I’m doing great. Thanks so much for having me on. CC: I’m going to go ahead and start it off, I want all of our listeners to know more about you so explain who you are and how you got to where you are today. AW: Wow! That is an very open question. 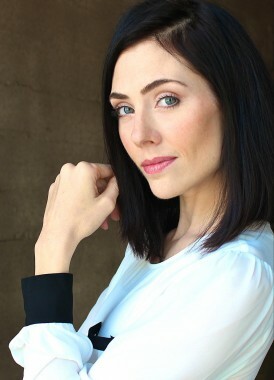 I’m Adrienne Wilkinson and I am an actress. I’m known mostly in the sci-fi genre though I have dabbled in pretty much every genre. I am most famous for playing Livia and Eve – the daughter of Xena on Xena: Warrior Princess and for being Maris Brood, both the likeness and the voice in Star Wars: The Force Unleashed franchise. Currently, I have all kinds of stuff going on luckily (knock on wood). I am playing Captain Lexxa Singh in the Star Trek: Renegades pilot which is a feature length pilot for what we hope will be a new Star Trek series. Just this weekend a movie that I am in called Raze came out in theaters and also on iTunes and all of the video on-demand options. I play multiple characters in the biggest radio drama in the world which is called Suspense. We’re sort of an anthology series or a revival of the 1960’s radio series so it has sort of a throwback feel and all of the episodes are a little bit spooky – kind of like The Twilight Zone. I’m in Venice, which is an Emmy winning webisode which was a spin-off of Guiding Light when it went off the air and just this week I filmed this really fun guest spot on Braddock and Jackson, which is the brand new Kelsey Grammer/Martin Lawrence sitcom that is about to premiere on FX. Those are a handful of the things that are going on. CC: I kind of want to get started on what brought you into the industry. When did you know that acting is what you wanted to do – or I should say performing in these roles? AW: Well, I grew up as a dancer so I have been on the stage since I was tiny and always loved that but I always loved it as a hobby, as a passion, but not as something I ever considered to be a career but when I was a senior in high school I got the opportunity to take an acting workshop that was taught by professional acting directors in Los Angeles, and through this fluke set of circumstances through meeting them, I ended up getting a job on a big show within about a week – which is absurd as it never happens that way. Everything about that was crazy and of course my family thought it was crazy too so I was not able to take the job because it was such a loop we were thrown for we were not quite sure if it was legitimate but it really lit a fire in me that acting was this amazing thing that I fortunately had a skill at – but you could actually make a living doing. That sort of changed my career path and as soon as I graduated high school I moved to Los Angeles. CC: Whenever you got started, your first breakout role was Xena: Warrior Princess. What was the audition process like for that role? AW: They did several rounds of the auditioning and the sort of trivia that goes along with my involvement is that I had turned down the audition several times because I was working on another project at the time, but they just could not find who they were looking for. They could not find the right fit so they kept holding auditions and about three weeks into that process I was able to go in. Truly, I didn’t think I had a chance as initially, the way the audition was written it was very secretive and they didn’t want anyone to know that there would be a daughter so it was strictly listed as a nemesis for Xena and I didn’t think I stood a chance as I actually thought that Xena and I looked alike and generally speaking when they are casting for television, if you have two people that are fighting against each other they like them to be very diametrically opposed and very different so I assumed that they would cast a blonde or a redhead or something, but of course I had absolutely no idea that the fact that we had some similarities in our look was actually a strength for me. It wasn’t until I was booked an I received the first script that I found out I was actually playing her daughter. CC: When they were casting, did they mention that there were two diverse personalities with Livia and Eve? AW: No, I had no idea about that either. In fact, I didn’t know that until I got the script that showed the personality change. Again, it was completely unknown for me so it was learning on the fly. It was certainly interesting, but I will say that it happened very quickly in terms of the storyline and was just in love with the character Livia. I just did not want to let her go, so it was kind of a slightly jarring transition for me to suddenly move to playing Eve when I had just finally found my feet in terms of fighting, and we had just gotten the costume to really work [laughs], all of those bugs you really have to iron out when your creating a character and we have sort of just figured everything out about her when everything changed so it was quite the ride. CC: Of course that was a big jump, but was it a bigger jump when it came to the physical and demanding aspects of it? You did a lot of outdoor work that is pretty grueling temperatures I’ve heard so what was that like? AW: It was pretty grueling and its always pretty grueling and you’re right, we filmed outside as much as possible. Every episode was approximately eight days of filming and they would always try to do at least five of those outside because it was just so beautiful and the landscape of New Zealand is just extraordinary so its silly not to use it. Yeah, it is more exhausting when you’re outside and dealing with the weather. It rained almost everyday and sometimes it was freezing and sometimes it was just sweltering so sure, that is an extra challenge. The fighting itself I really dug. It took me a couple of days to get into it but once I was into it I really found it empowering and fun to do. Yes, I did have a stunt double, we all did, and you had different stunt doubles for different things so I had a double for horseback riding and a double for the flipping during the fights or a double that specifically for dealing for something like fire or something. It was broken in a pretty interesting way that would keep everybody safe so I always felt protected and I always felt brave enough to do whatever I could to make it work. The first couple of days I’m sure I was terrible because I was always scared of hurting somebody or being hurt in the fights but as soon as I realized that is just looks terrible unless you give it all you got, I changed my attitude and felt really empowered and enjoyed it. CC: After Xena wrapped – as it finished in season six, what was the next step for you? I mean, you landed this hugely successful role – what made you go into the directions you went to. You did some guest spots in Charmed, and I believe Angel and a few others as well, so what led to that transition out of that realm outside the Xenaverse? AW: You just sort of go for whatever opportunities that present themselves and right after Xena I did a show for UPN called “As If”. It was a dramedy and a UK series that was very successful and they brought it over and we shot half a seasons worth of episodes. I really had an amazing time working with that cast and we had very high hopes for the show but as it happens, that is one of the shows that was sadly not given a chance. I think that we only had two episodes that were on air before we were replaced by a really ridiculous reality show [laughs]. CC: That is kind of how it seems to be. AW: Yeah, right? You just roll with the punches and everybody wants to be in front of the biggest and best opportunities and everybody is fighting their way and clawing to get in front of whatever they can get in front of and you just in my opinion – say yes to the opportunities that present themselves as long as they are in line with the art that you’re trying to make. That has kind of been my experience. I have dabbled a bit in all different sorts of work because that is what has come down the pipe for me and it has been a really interesting journey because of it. CC: Whenever you did Star Wars: The Force Unleashed, you played Maris Brood. How did that opportunity come about and voice acting in general because you did a few other voice acting roles for what I believe was Bratz on the GameCube as well, so how did you get mixed into voice acting? AW: I’ve done about twenty video games at this point and I just sort of fell into it because of my theatrical work. I was recommended to a voice over agent and we just decided to give it a go. The very first job I got was doing a Scooby Doo video game, but it was based on the movies of Scooby Doo and I was able to voice match one of the actresses that was not available. I really enjoy voice work as you get to do characters that you would normally not have the opportunity to do on screen. You can play different creatures, different ages, you know. Its a lot of fun and there is a lot of freedom in it that I enjoy. Specifically, playing Maris came along because they had already developed the concept art and they had been working on this game for several years and it came time to do the voice work and motion capture work and they were looking for actors to fit the art that they created. I was really lucky as the headshot that was put in front of them looked almost identical to the art that they created for Maris. Its kind of funny how it works that way and the same thing happened to Sam Witwer. His current look and his current picture at the time – you would have thought that they had modeled the characters after us but it was just lovely that it happened that way – just luck that we happened to land in front of those opportunities and happened to be what they were looking for. When we auditioned, it was different than a normal voice position as it was done face to face so that they could see your physical movement – it was all filmed, and luckily they liked what they saw. It was a couple of years that we worked on that project, little bits here and there because of the time it takes to animate a game and all of the stuff that happens behind the scenes for any type of animated project takes longer than you can imagine. Yeah, that is kind of how it came together. It was sort of a lucky twist of fate. CC: I played The Force Unleashed II as well and I didn’t see much of Maris Brood but is there ever a chance that we may see a conclusion to the character as it really left open-ended. AW: Oh, I agree with you totally! Two things, my understanding and I heard it from several reliable sources so I take it as truth is that they always intended to do a Force Unleashed III, and everyone had loved the character of Maris Brood and she was supposed to have a huge focus in the third game. When that project was set aside it was kind of crushing for a lot of people but for me in particular because I really just loved that character and really wanted to see where she would go. I have no idea what could happen with her, though one thing that stands out to me at the moment is that Maris Brood existed in the same time that rebels is happening, so I am really curious if they will find a way to bring Maris into the new series. CC: That would be great as like you said, she was a very diverse character. You had a lot of other characters in the game that were interesting, but her whole persona was a stark contrast with every other one in the game. AW: Yeah, she was great, even beyond what you saw. The thing I loved so much is that they developed this incredibly rich history and backstory for her. When I was first hired they gave me sort of a – for a lack of a better term, a bible for the character and it was probably at least ten pages of everything they had decided about how she had grown up and all of her background and what made her who she was. It was a tremendously interesting story, and it was just the kind the character that you couldn’t even believe that you were lucky enough to get to play someone who had such an interesting story. Sadly, I felt that just a fraction of that made it on the screen because at that point and time the part she was playing in the story didn’t need any information about her. She was just sort of a tool to get you to the next part of the story at that point. Just the fact that they had this much developed, there is so much that not only could be explored but I think everybody would enjoy it because just the parts I am aware of, just the parts that were shared with me was just really amazing. I hope more comes from her. CC: Moving from Star Wars to another whole fandom, I want to speak about a more recent project. 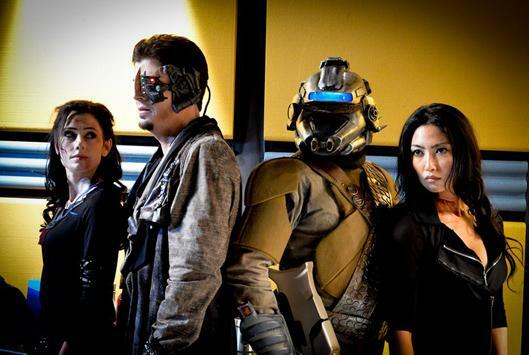 Its Star Trek: Renegades, which I kind of fell into by accident. I seen the trailer from your Facebook page, and I seen the clip and I was like “WOW!” so explain just what Star Trek: Renegades is. AW: Well, Star Trek: Renegades is a feature length pilot to what we hope is a new Star Trek series. This is the first decade that there hasn’t been a Trek series since its inception, and I think the fans are really missing it. We have created this project that is completely connected to and honoring the canon of Star Trek, yet completely different than anything that you’ve ever seen. We are telling the story from a new place. I play Captain Lexxa Singh, and it is called Renegades because my crew is made up of criminals and rogues and people that are just generally not your typical Star Fleet officers. Instead we function much more like a Black Ops team where we are doing missions that are technically sanctioned by Star Fleet but are unacknowledged and unknown. Its very select in how the missions come together and these are missions that have to be done but they are kind of the thing that you don’t want to have to do and don’t want to have to acknowledge. We are doing the stuff that is required. We are doing the stuff that is required to keep peace and to save lives but we do it in a fashion that is more questionable perhaps than missions you have seen. We are also a different kind of crew. The best description I have heard of us is that we are sort of like a wolf pack and we work together, we are incredibly good at protecting one another, and working together as a team when we need to, but equally there is a lot of politics between us, and a lot of conflict. There is sort of an inner-personal dynamic from this series that you haven’t seen before just purely because the conflict exists and you are having to confront a lot of things that normally were side-stepped in previous Star Trek iterations. I personally think it makes it more interesting as you have all of those values and morals and all of that history, but you are coming at it from a different direction. It looks different, it feels different, it feels darker, and I’m obviously bias [laughs], but I definitely like it. CC: Yeah, I have actually showed it to a lot of friends who are Trekkies, and as soon as they heard Chekov, it was over. Your Captain now, and if this pilot goes through, you will be immortal. How exciting is that to you? AW: Oh it’s thrilling! It is also terrifying as I have experience with big fanbases and I know that it is hard to please everyone and hard not to disappoint fans who are so passionate about the projects that they love, and I have just tried to create this character that I find dynamic and interesting and just really delicious. I just love this character and I just hope that everyone sees what we seen. You know, we were all thrilled with the project and thrilled with how it looks and the way it came out, the way the direction was put together. I feel and think people are going to love it but like I said, I’m bias, so we shall see. CC: What is the process to get a series like this greenlit? I should say I know you went through Kickstarter but what would be the steps needed to take to get it from point A to point B beyond to standard primetime television? AW: Its tricky. I should preface this by saying I am not one of the producers so I am not intimately involved in this part of it but basically my understanding is that CBS and Paramount own the rights, so they have to be given the opportunity to see if they want it as a series but we have absolutely no idea what they might be interested in and if it would fit with their roster and the direction of their network and what they’re feeling. From there the waters get a little blurry. A lot of people are saying if we can’t make it a new series that we should be an online series and there are several outlets that would definitely be interested but it then becomes a bit more tricky because of the ownership rights and the certain legal limitations and hoops that would have to be jumped through. I’m not exactly sure how that would work, but what I can say is that when we come with something this interesting and this appealing, I think that its going to find a home. It may not be the home that we think or we might be surprised. This is kind of uncharted territory for everyone so it will be interesting to see how it all shapes out. CC: With the rise of Netflix as of late, they have been doing a lot of original series, which was the first thought that came to my mind that it would be a fantastic idea to get Star Trek relaunched on Netflix as a brand new series. AW: Oh, absolutely. I think a lot of people are interested in that idea, but again, its not just about who is interested. Its about walking that fine line of getting the permissions you need to get and just making sure all of the legalities are covered. Its about making sure that all of the parties involved are in agreement so that is where it is kind of tricky. CC: Moving on to your next project, this one is in select cinemas which started on January 10th was Raze with Zoe Bell. Explain a little bit about Raze as it has the prison scenario going on with the fighting. AW: Yes, it does, but I have to say it is not the traditional “woman in prison” idea that you might think. Raze is an action/horror movie. The concept is that it is about a group of women that are kidnapped and it turns out that this is a yearly process – that 50 women are kidnapped because of this cult that runs this sort of gladiator arena each year. They not only kidnap these women and force them to fight each other, but they are required to win or else as each of them have loved ones who are held hostage – to which each of them would also be killed. You have these women who are not fighters or warrior women, but secretaries and housewives or college students who have been stolen out of their regular lives, and then they are forced to fight each other, not only for their own survival, but for the survival of their loved ones. It creates a very multidimensional, vicious journey that you are going through with these women. You can see the emotional highs and lows of these women not wanting to hurt each other, but not wanting to die and not wanting to see their loved ones hurt and you just see that in sort of the mental torture that they’re going through as as they try to figure out what is the best course of action and how do they try to survive these terrible circumstances that they have been put in. Its certainly not a movie for everyone and to be blunt, not the kind of movie I’d typically be drawn to, but I’m really proud of the work from everyone. Its a very difficult movie to watch, its very violent, although anyone who loves action – there is some great action in it and great fighting scenes. Its also very tricky as its very easy to dismiss it as just being gory and its not that at all. It has a much deeper message about the woman’s role in society and also just the idea of violence with women on screen. The interesting thing about this film is that I don’t know if its very much different than what you would see with men, but seeing it with women is definitely more jarring and it hits you in a different way – no pun intended. We have had some fantastic feedback this week which is really pleasant, and you know it was a very small project. We shot this in a month, and it has some great actors in it. Not only the amazing Zoe Bell, but Tracie Thomas, and Rebecca Marshall. It has Doug Jones and Sherilyn Fenn- just a whole host of people who are incredibly talented and they take the material to a better level than you might expect. CC: Zoe Bell, does she do all of her own stunts? I mean, does she continue the tradition of doing her own stunts for this or does she have her own person for this role? AW: There actually are not any stunt doubles in this movie. Everybody did their own thing. CC: Oh wow, that is actually pretty awesome then. Was this the first time you ever done your own stunts or did you have to do stunts for this movie? AW: Well, no. I mean, starting with Xena I did my own stunts in terms of what we were legally able to do. In terms of insurance purposes, you know the reasons that actors do not do 100% of the stunts is because your insurance companies won’t – and they’re too afraid of you getting hurt so they are not going to put you in a situation that could risk that as it could stop the entire production but the type of fighting in this movie is very down and dirty street fighting. There is no weapons and it is hand-to-hand combat. It was very specifically choreographed, but there weren’t any tricks because these are not women that are supposed to have incredibly fancy fighting moves. The fights are just as much of an emotional journey for this movie as any of the dialogue or any of the scenes of these women breaking down. I mean, the violence in itself is something that these women are having to fight through everytime they step into that room, so it is a different kind of violence. A few of the actresses that were involved were stuntwomen in addition to Zoe Bell, and there was a great stunt coordinator on the film and everybody just made sure that every fight looked fantastic. Its crazy, we did like 21 fights in 24 days or something, I mean its a really intense schedule. CC: Of course Zoe Bell was the stuntwoman for Lucy Lawless on Xena but another Xena cast member, Renee O’Connor, is working with you on Broken Things and she is the director for that, so how did that come about? AW: Yes, that is a short film that is also being used as a pilot presentation as they are pitching it as a new series, and we shoot that this coming week. I’m really excited about it. Renee directed one of the episodes of Xena that I was in, but I haven’t worked with her in that capacity since so I am really excited for us to be sharing those hats again. I think it came together because the writer/producer, her name is Kat Greely. She approached me and also approached Renee, and the two of us were thrilled with the idea of working together again. I don’t really know what else I can say about it as we haven’t shot it yet but its days away. We start working on it on Friday and I’m excited to see what we come up with. Its an interesting story, I get to play a detective. We are shooting outdoors in the woods which is always an adventure, and yeah, there is some murder and mystery and it is pretty intense. CC: Speaking of the woods, whether it was Xena or any other role, what was the craziest experience you have ever had on set? AW: One of the times I was working on Xena, I want to say it was the wardrobe trailer – but one of the trucks caught on fire while we were outside in the woods so that was quite a scare. Not just because of the fire itself and thank goodness they noticed in time before it really became overwhelming but it is quite tricky as that is truly an example of us being in the middle of nowhere in the middle of these woods and trying to get a fire engine there would have been quite tricky. CC: The next thing I would like to speak about is Suspense as you spoke about it earlier. You play many different characters and of course that is on Sirius – can that be compared to something – say your voice acting from video games or how does that work when you have to shape up for a character? Do you just use your imagination when you’re trying to visualize all of these people? AW: Its definitely, hugely informed by imagination. We usually get the script a few days or a week ahead of time, where we get time to play with it – where video games you usually do not get the material until you step into the booth because it is very confidential and they don’t like to give that information out. With this show, your partly dealing with archetypes like a 1950’s housewife or a southern bell or just things like this, there are sort of these broad characters that you are playing so you just have to tune them to be you but you have certain parameters that you have to meet so that everyone picks up on the fact that she is a wealthy southern woman or something. Its just a lot of fun as you’re playing a lot of people and the cast varies from each episode and its just like recess. Its like we are all getting together and get to play a game for a few hours and it makes it a lot of fun. The episodes are smartly written, but they are also not so serious that you can’t play around so you know, its a nice mix. Its also fun as I sort of mentioned Twilight Zone earlier as a reference as it has a horror vent, which also makes it fun as your playing with certain expectations that you want to give the audience literally the suspense but also that tingle down their spine or make them laugh because something is silly or just a little over the top. It runs from the sublime to the ridiculous and all of it is fun to play. CC: My next question is regarding the future roles you have set up. Do you have anything massive coming up in the future? AW: Luckily I have lots of little things I am working on but I don’t know how much of it I can share yet. I just finished wrapping a movie called Burning Dogs, which is really funny and I am very interested to see what happens in this movie. They think that they will have it put together by March, and I would imagine by March or April, whenever they see everything come together they can find out what kind of distribution or if they are going to try to go to festivals to get it some notice, but its really hilarious as its shot in a way where the camera is actually playing a role in the film, so the rest of us are constantly breaking the fourth wall and sort of talking to the audience or talking to its character and they shot it in a way that was so innovative that everyday was an absolute delight as everybody brainstormed to make this work. They created things that were just – I am just so impressed with the DP on this project as they did things that just should be impossible like with the DP with this enormous camera on his shoulder and also on rollerblades and also going backwards and racing down a hill and ducking from gunfire. Its a real trip but I’m real excited about it. CC: I was actually watching Goodnight Burbank last night actually, I was watching the pilot episode on HULU. This sitcom has a kind of sarcastic vibe to it and this was another project you were in, and it had some very well made, on point humor – and it was a little dark too, but what was doing Goodnight Burbank like? AW: It was interesting. I am so happy of how you described that, as it is not a traditional sitcom, but it is incredibly smart humor. It borders on being politically incorrect constantly, and you sort of have to know what you’re getting into because people seem to have one of two experiences when they tune into it. They either immediately love it or immediately hate it because they think its offensive because they’re not understanding that it is satire, so I’m so happy you picked up on that because a lot of the things that seem sort of heavy handed are done intentionally because those are jokes that come back around and have an actual social commentary. It was a delightful group to be a part of. It initially aired on HDNet, which I think has now become a music channel but last year we aired on HDNet. There is still a chance we could get a second season, if not through HULU, we have actually had some invites from other outlets so it could find some legs and grow again. I would definitely jump back into that in a heartbeat as there are some exciting ideas that they had for my character for season two if it were to actually happen so fingers crossed. CC: Whenever you go to these conventions – as you have one in February coming up for Xena, what is the experience like to have all of these people so interested. For Xena it has been 15 years for you and I am sure you probably get messages from Star Wars fans and now Star Trek fans. What is it like being attached to so many different fandoms? AW: Its lucky, I mean I never have any complaints. Its an amazing thing to be a part of. And yeah, conventions are a trip because you get direct feedback of those who enjoy your work and sometimes you get feedback of things they would change or wish was different, but I never lose sight of the fact on how lucky I am that someone cares or that they have an opinion at all about my work. Conventions are enlightening as you get to get feedback in a way that you normally don’t get and you get to have real discussions with the audience that truly care about your projects and are invested in a real way and it gives you a different perspective as normally you are trying to get your ratings at a certain mark or make a certain budget or whatever. Its refreshing and a good experience to have that face to face connection with fans. Its always lovely. CC: I imagine it sort of brings everything full circle for you. AW: Yeah, definitely as I am certainly a fan of tons of projects, so you have the respect on both sides. CC: To wrap this up, where do you want to be in ten years? I know that is a broad question, but since we started with one, I figured it would be a good way to end it. AW: I would say that I hope that in ten years I am at a place where I am enjoying the work, and that I am able to create projects. I see all of this work as baby steps, leading to do what you most want to do. As opposed to one specific dream project, my dream is to be in a career where you are making a living but having a good time doing it. This career can be more physically challenging and exhausting than most people realize. If you never have been on a set you might not understand the level of effort and time that goes into a series where 12 and 14 hour days are the norm and where it can be overwhelming of the amount of work you are having to do in the time you have to do it. Because of that, you want to take this passion that you have for this craft that you love and put it in an environment where it gets to thrive so I am just hope I am working on projects that are creatively challenging and interesting and that I am continuing to get to work with amazing people. That sounds incredibly vague, but it also covers all my bases. CC: Well, from a fans perception it looks like it has grown quite big. On that note I want to thank you for joining us here Adrienne, and we appreciate your time with us today. AW: Thank you guys so much for having me, I had a blast! We at Capsule Computers thank you for tuning in to this very special interview and want to thank Ms. Adrienne Wilkinson again for joining us.